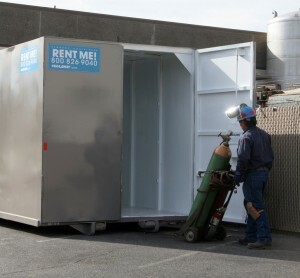 Surprisingly, the cheapest storage container rental in San Bernardino comes from the most experienced company in the area. Haulaway Storage Containers has been providing cheap container rental to every individual or business that needs one since 1968. When you need a cheap conex for rent during a remodel, new construction, expansion or when you simply need more space for those times when sales ramp up, turn to Haulaway Storage Containers to provide you with the storage container that’s right for your needs. Most of the time we think of storage containers as only coming in one size, but Haulaway has changed that. We are familiar with the forty foot container, but there are times when smaller containers are better for the job at hand. When you call Haulaway for a cheap container rental, they can offer you a conex for rent that is as small as ten feet and as large as forty. There are even three sizes in between to ensure you have the cheapest storage container rental in San Bernardino and the one that fits your needs in exactly the way you need it to. When it comes to security the patented Rhino Locking System is in place on the twenty and forty foot containers from Haulaway. These are the most common sizes used when a customer needs a rental container. The 21 and 26 foot containers are fitted with doors on both ends to offer airflow, making them the perfect cheap container rental for use during the hot summer months. Even though Haulaway offers you the cheapest storage container rental in San Bernardino, you still enjoy a high quality container made of high strength steel to provide security and protection to the items kept inside. For pricing, please fill out the Quick Quote form and someone will get back to you shortly!